Urban Nouveau is an urban development firm that puts location at the heart of every new project. It has come up with an inspirational idea to save the Old Lidingö Bridge in Stockholm (picture above), which currently faces demolition by the local council. Built between 1917 and 1925, the bridge has a lattice structure similar to the Eiffel Tower and connects Stockholm and the island of Lidingö. Employees at Urban Nouveau regularly use the bridge and love its “striking steel arch, its tranquil waterside location and beautiful west facing views”, so decided to incorporate new plans for housings into its structure. 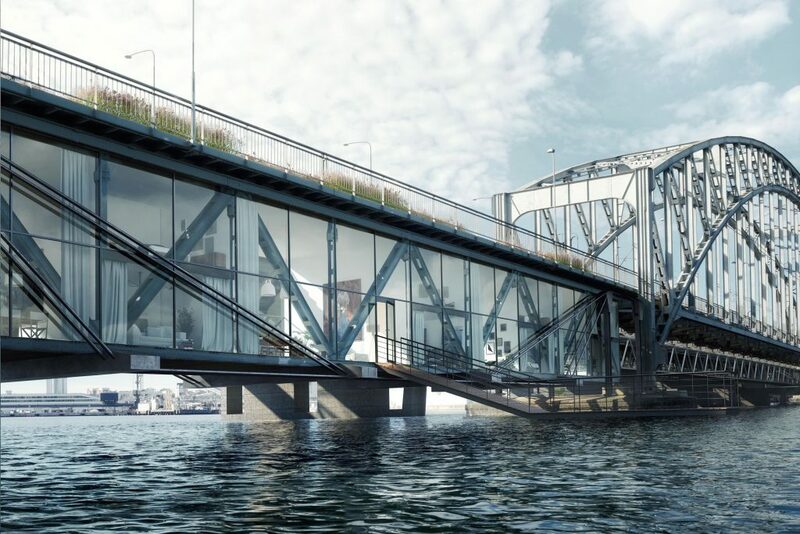 They want to build 50, premium, west-facing apartments inside the structure of the bridge and at the same time creating a pedestrian park similar to the Highline in Manhattan, on the bridge above. Urban Nouveau says the plans are not only socially and ecologically beneficial to the city and its residents but will also save the council some £11m. 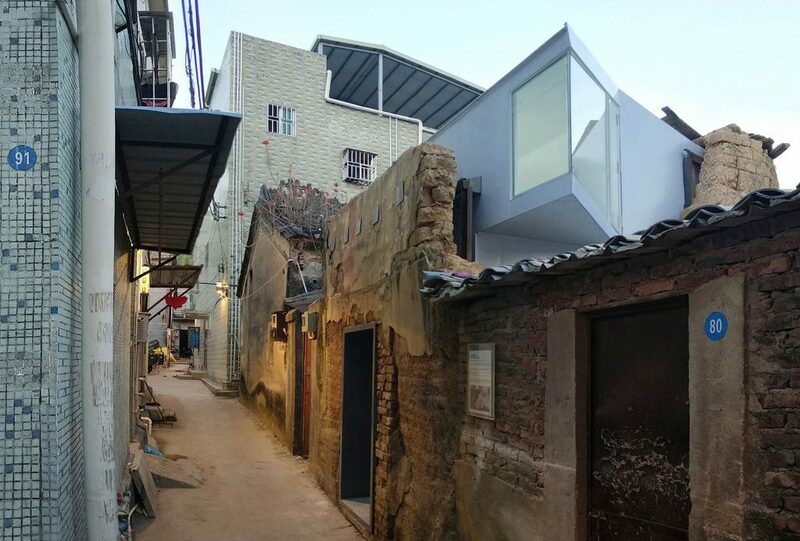 Beijing-based People’s Architecture Office (PAO) / People’s Industrial Design Office (PIDO) has come up with a design for The Plugin House (above), that works with the current policy amongst Chinese local authorities to encourage the construction of small, “infill” homes to help solve the housing shortages faced by many cities. Called “Accessory Dwelling Units (ADUs)”, these small houses are designed to provide an alternative to the outward expansion of cities and allow residents to take advantage of existing infrastructure, public services and communities. The Plugin House, made from prefabricated parts and taking into consideration financial, social, and environmental factors, is just the latest in a portfolio of forward-thinking designs from PAO/PDO, whose previous work has won multiple Architizer A+ Awards, Red Dot Awards and the World Architecture Festival Award. The studio’s works have been shown at the Venice Architecture Biennale, Rotterdam International Architecture Biennale, the Harvard Graduate School of Design, and exhibited in cities including New York, London, Milan, Seoul, and Hong Kong. It’s no secret that housing in London is in crisis. There’s a shortage of homes affordable for people on average or low incomes and the issue is now a political football. A creative studio working across architecture, design and art-based projects in London — Unknown Works, has collaborated with Hildrey Studio, an award-winning practice that combines its architectural skills with art to design buildings, installations and services. Their Space Gap installation was created for the London Design Festival, which ran from September 19 to 22nd this year. A take on the ‘wealth gap’, the project, Space Gap was a pavilion, set in front of Kensington Olympia, and event programme that scrutinised design and social issues ranging from homelessness to ghost mansions through a range of film screenings, talks, debates and in the immersive design of the pavilion design itself. The collaboration aimed to create an open forum to stimulate debate around the contrasts in size, quality and density of homes in the UK capital. Grimshaw Architects is a practice with offices across the globe. 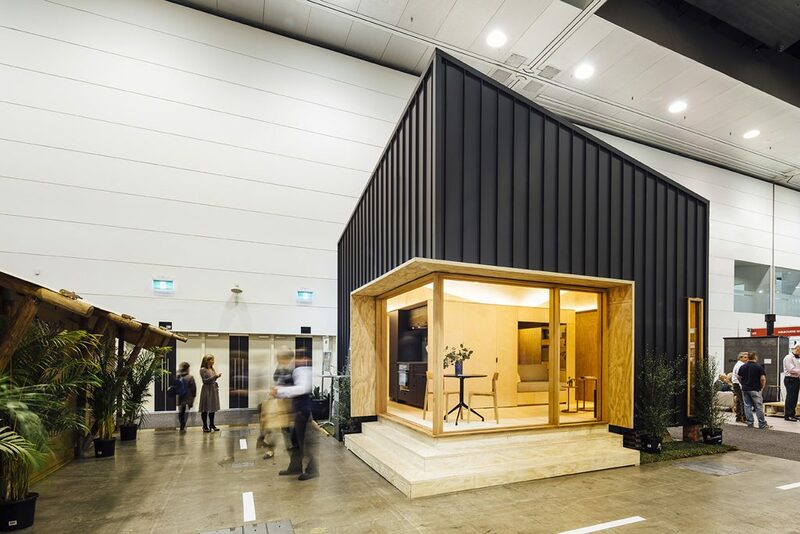 In Australia, it’s just launched The Peak (above) — an affordable, sustainably tiny home with a footprint of just 32.5 m². Grimshaw created the design for Nestd, a project from Kids Under Cover — an organisation that works in Melbourne to prevent youth homelessness. The Peak can be built in the backyards and gardens of family homes – easing the pressure on families and in so doing, helping to prevent homelessness that so often occurs through family disharmony. The Peak is one of three homes on offer through Nestd, boasting a double-height entrance and a kitchen, bathroom, laundry, bedroom and couch spaces integrated into one cube-shaped pod. 100% of the profit from every home sold by Nestd is directed back into Kids Under Cover’s charitable work.